Coming home to a house that your dog has been peeing in is not a very pleasant experience.According to the VCA, dogs may urinate or soil inside for numerous reasons.Now the problem is how to stop the dog from peeing in the house. Determining why your dog is urinating inside while you are gone is the first step to helping overcome this issue. Ask yourself the following questions and consider these potential causes of indoors urination to find a solution that works for you and your dog. Has Your Dog Been Cleared of Medical Concerns? Vetstreet recommends that if your previously house-trained dog suddenly starts urinating indoors to have your dog cleared by a veterinarian to be certain that the problem isn’t being caused by medical issue. Bladder stones form in your dog’s bladder and take up room, making your dog need to pee more often. According to the ACVS, we aren’t sure what causes these stones, but diet is likely a factor. Stones can be surgically removed, blasted apart so that they pass naturally, or may be controlled with diet. Urinary tract infections are fairly common, especially in smaller breeds. According to the AKC, dogs usually get UTIs when bacteria from the skin and GI tract get into the urinary tract, leading to infection. About 14% of dogs will be affected at some point in their lifetime. This infection makes your dog feel like she needs to pee all the time and causes only a small amount of urine to be passed at a time. Your veterinarian can treat the infection with antibiotics. According to Doctors Foster and Smith, soiling and peeing in the house regardless of how soon the dog has been outside is a common sign of Canine Cognitive ​Dysfunction. If your dog is older, and especially if she is showing other signs of confusion, it is likely that she is suffering from this disease, which is similar to Alzheimer's in humans. Even your dog pees when scared. What to do: Make sure your dog is healthy before proceeding with any training regiment. The Spruce Pets says that most urinary issues can be treated with medications, but urinary stones may require surgery and there is no cure for Canine Cognitive Dysfunction. Belly Bands - Washable belly bands are a good option for dogs that only have urinary incontinence. Just wash when soiled for an inexpensive solution. Pen and Paper- If your incontinent dog isn’t willing to wear diapers or a belly band, a pen with papers to catch the urine might be your best option. Essential oil to stop dog peeing-There are some essential oils which helps to minimize such urination. Indoor pee pads for dogs- If they can be trained then the indoor pee pads can be easily used after use. Pee grass for dogs- In case there is no grass in the back yard or front yard because they are cemented for cycling, playing or for keeping flower pots you may keep some small place with grass growing on it and train your dog to pee there . The earth will soak it all and the sun will dry it out naturally. Was Your Dog Ever Fully House-Trained? If your dog is young or comes from another home, she may never have been fully house trained. If you have spent a lot of time with your dog and let her out frequently previously, but are now spending long periods away from home and your dog is having accidents, it is possible that your dog will never fully internalized the rule that she should eliminate outside. It is very important to crate train a rescue dog, especially at the beginning, for house-training and other behavioral reasons. What to do: The VCA recommends that you review house training and go back to a house-training program if you suspect that your dog was never fully house-trained. The American Humane Society gives some great tips on house training puppies if you need a refresher. The American Humane Society lists many important advantages of spaying or neutering your pet, and one of the most important advantages is that neutering decreases the incidence of marking in your home. Marking is when a dog, usually a male but sometimes females, mark on upright objects (VCA). While even some neutered or spayed dogs might mark, it is much more common in intact dogs, especially intact males. If your intact male is marking in your house, it may be that the drive to stake out his territory against the neighbourhood dogs outside is just too strong to resist. What to do: Neutering or spaying is likely to solve the problem. If this isn’t an option for you, you can try using a belly band or restricting your dog’s movements inside. Have There Been Big Changes in Your Life? What to do: If you suspect that your dog is inappropriately marking for reasons like these, it may be a good idea to keep your dog crated or in a contained area while you are away until your dog has adjusted to the change. Is Your Dog Experiencing Anxiety? According to the ASPCA, separation anxiety is one of the most common complaints of pet parents. Dogs that are experiencing separation anxiety may perform a wide variety of behaviours in an attempt to relieve their stress, including urinating inside. If peeing inside is paired with howling or other vocalizing, attempts to escape, or destructive behaviour, it is more likely that the culprit of your dogs inappropriate peeing is anxiety. Simply crating your dog or restricting her movements isn’t a good solution for this problem, since she will turn her anxiety on the crate and herself. 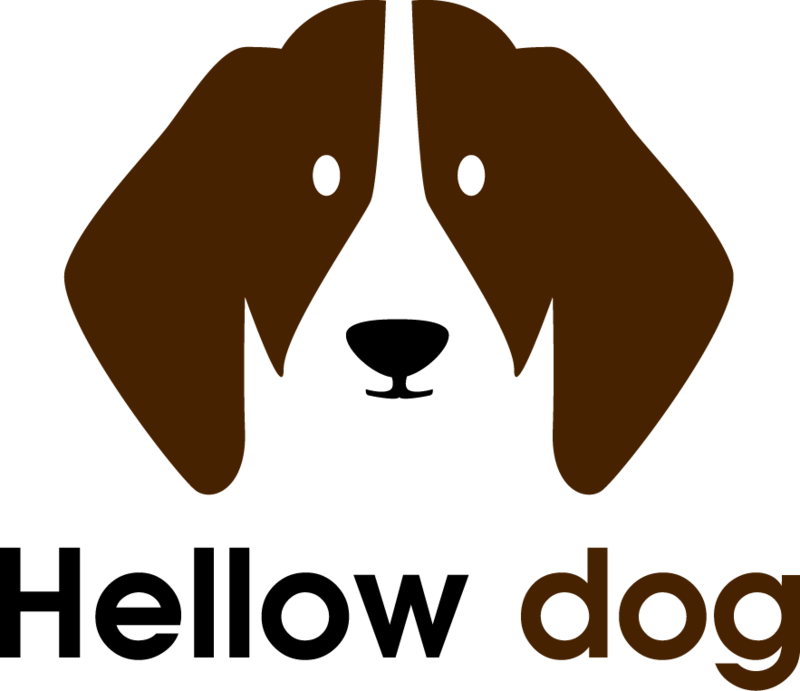 What to do: According to Dogster it is great taking your dog to dogie daycare to distract your dog while you’re gone and remove her from your home, eliminating the problem of inappropriate urination. Whatever the reason for your dog peeing inside while you are gone, here are some tips to follow as you work towards a solution for your dog. Never punish for urination-Punishing your dog for urinating is unlikely to stop the behaviour, but it may cause your dog to fear you and hide all urination from you. 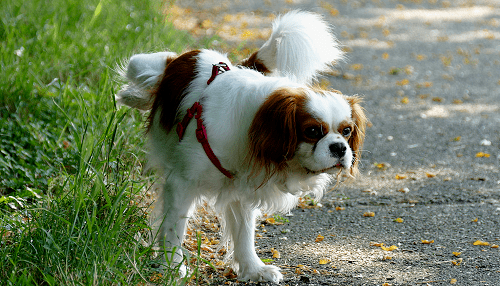 This could cause your dog to stop urinating when you take her outside as well. Always clean up thoroughly- The more carefully that you clean up, the less likely your dog will be to urinate in that area again. Dogs tend to urinate where they can smell prior urination, so cleaning up with enzyme cleaners that totally destroy the smell is essential.You may also use best dog pee cleaners that are easily available in the market. Restrict movements- It isn’t a good idea to crate an anxious dog, but there is no reason to let a dog that is urinating inappropriately have free rein of your home. Keep your dog confined to a room or area where you can easily see and clean urine. 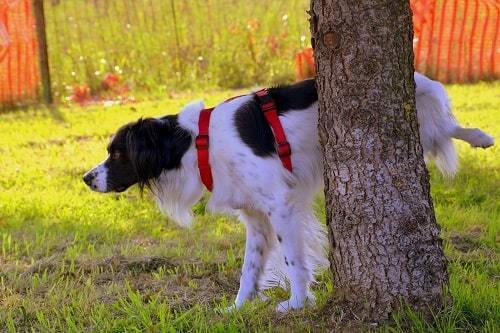 Take time outside- Dog owners are often surprised to find that their dog pees soon after being brought out. Many dogs like to pee several times on a walk or outing, so be sure to give your dog plenty of time to pee. Monitor water consumption- You shouldn’t restrict your dog from drinking water, but if your dog drinks a gallon after your morning run and then can’t go out because you’ve gone to work, you can’t blame her for needing to pee. Make sure your dog can go out soon after consuming large quantities of water. 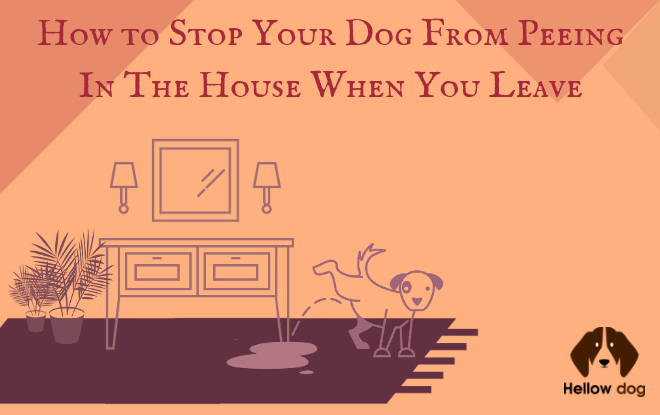 A dog that pees in your house while you are gone can be very frustrating, but don’t lose your patience. This is a common problem with many causes and potential solutions. 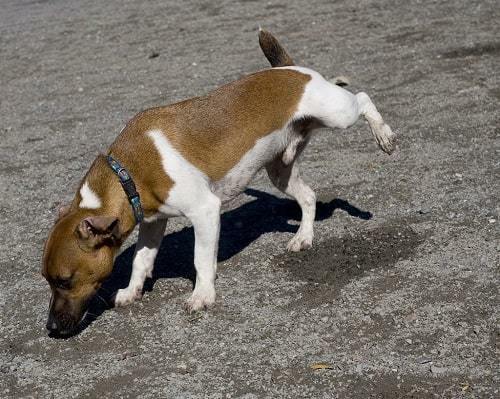 Do your research and carefully examine your situation to find out why your dog is peeing inside while you are away and to find the best solution for your situation. All information contained in this website is intended for informational purposes only, as I am not a veterinarian. Furthermore, the content of the website should not be understood as an appeal to ignore the instructions or advice that may be issued by your veterinary doctor.